^ WATCHMEN (18). Paramount Pictures. British Board of Film Classification. February 13, 2009 [July 27, 2013]. ^ Eller, Claudia. Warner Bros. and Fox settle 'Watchmen' copyright dispute. The Los Angeles Times. 2009-01-16 [2011-10-12]. ^ Watchmen (2009). Box Office Mojo. [2010-08-30]. ^ Newgen, Heather. Malin Åkerman Talks Watchmen. ComingSoon.net. 2007-09-29 [2007-09-29]. ^ 5.0 5.1 5.2 5.3 Crocker, Jonathan. Hero Complex. Total Film. February 2009: 52–59. ^ 6.0 6.1 6.2 6.3 Kit, Borys. Watchmen powering up with castings. The Hollywood Reporter. 2007-07-26 [2007-07-26]. （原始内容存档于2007-08-01）. ^ Adler, Shawn. John Cusack Calls Hilary Duff 'A Revelation'; Has His Eye On Watchmen. MTV. 2007-06-13 [2008-02-20]. ^ 8.0 8.1 8.2 8.3 8.4 Hewitt, Chris. Under the Hood. Empire. March 2009: 76–85. ^ Crocker, Jonathan. The Characters of Watchmen. IGN. 2009-02-11 [2009-02-12]. （原始内容存档于2009-02-14）. ^ Adler, Shawn. Is Rorschach 'Watchmen''s Most Heroic Character? Jackie Earle Haley Thinks So. MTV Splash Page. 2008-08-21 [2008-08-21]. ^ Adler, Shawn. 'Watchmen' Images Revealed! Plus Rorschach Speaks Exclusively To MTV. MTV. 2008-03-06 [2008-03-07]. ^ Leupp, Thomas. New Watchmen Footage Raises New Questions. ReelzChannel. 2008-10-07 [2008-10-07]. （原始内容存档于2008-10-10）. ^ Capone Interviews Ozymandias! Matthew Goode Talks Brideshead Revisited and Watchmen!. Ain't It Cool News. 2008-07-21 [2008-07-22]. ^ Epstein, Daniel Robert. Talking to the Voice of Hellboy. Newsarama. 2007-03-13 [2007-03-13]. （原始内容存档于2010-01-15）. ^ Newgen, Heather. Morgan and Butler Talk Watchmen. Superhero Hype!. 2007-12-08 [2007-12-09]. ^ Graydon, Danny. Review of Watchmen: Original Motion Picture Score. Empire. [February 8, 2010]. ^ Watchmen: Original Motion Picture Score. IGN. March 4, 2009 [February 8, 2012]. （原始内容存档于2012年7月15日）. ^ Watchmen Movie Reviews. Rotten Tomatoes. IGN Entertainment. [2009-03-20]. 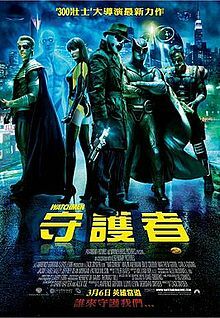 ^ Watchmen (2009): Reviews. Metacritic. CNET Networks. [2009-02-22]. ^ Kolan, Patrick. Watchmen AU Review. IGN AU. 2009-02-23 [2009-08-12].